With the release of Nutanix Karbon TP, PC 5.9, you may want to deploy some of the traditional addons like Kubernetes Dashboard with Heapster. 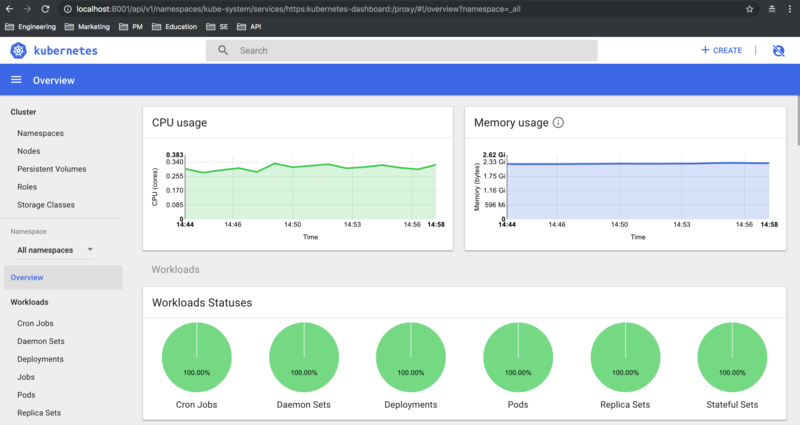 This post walks you through the process to successfully deploy the Kubernetes Dashboard addon. Before you can start with the deployment of the addon you need a working Kubernetes cluster and the kubectl CLI-tool. Heapster is deprecated. Consider using metrics-server and a third party metrics pipeline to gather Prometheus-format metrics instead. See the deprecation timeline for more information on support. Currently only Heapster integration is supported with Kubernetes Dashboard, however there are plans to introduce integration framework to Dashboard. It will allow to support and integrate more metric providers as well as additional applications such as Weave Scope or Grafana. If you would like to access the Dashboard without use the proxy, you can use the following URL. Make sure you don't use Chrome because you will get a certificate warning and the Dashboard won't work. I recommend for the Dashboard you use Firefox. Make sure you replace localhost with your Kubernetes Master address. Congratulations! now you have a Kubernetes Dashboard with Heapster up and running. How did you enable a username/password for credentials to hit the secure URL for the dashboard. From my testing with the dashboard, it always prompts for a kubeconfig file or token given it only has the concepts of service accounts - I am not able to get it to work to prompt me for a user/password. I didn't deploy Heapster, just the dashboard for the moment. Jut curious if there is something I might be missing. thanks! Copy the token and paste it in the K8s Dashboard website. That did work when I was testing. I thought maybe I was missing something on the user/passwd and I wanted to validate since getting into the dashboard has become locked down with the later versions and RBAC.....was hoping I was missing something to make life easier. Thanks for the quick response and update to the post! I'll continue on with my testing. echolaughmk: if you want to use the usename and password provided in your kubeconfig file you need to enable basic auth on the dashboard deployment. use `kubectl edit deployment kubernetes-dashboard -n kube-system` and add `--authentication-mode=basic` to the args for the dashboard container. Thanks. That had worked previously when I tried it. I initially thought there was a trick I was missing with RBAC since that is preferred in the later versions of K8S, but you are correct if you change the authentication method and remove RBAC from the equation.